The .450 no2 is my favorite cartridge in the double rifle world next to the .600 nitro express. George Caswell likes it, too, as his favorite. It is impressive in its 3 1/2" length and just looks so balanced with the bottle neck and a .500 base with a thick rim. It has the lowest chamber pressure of the big rounds, too. Mark Vaz added this beauty to his collection and I'm sure he will hunt with it. (See Mark's buff on the trophies page). 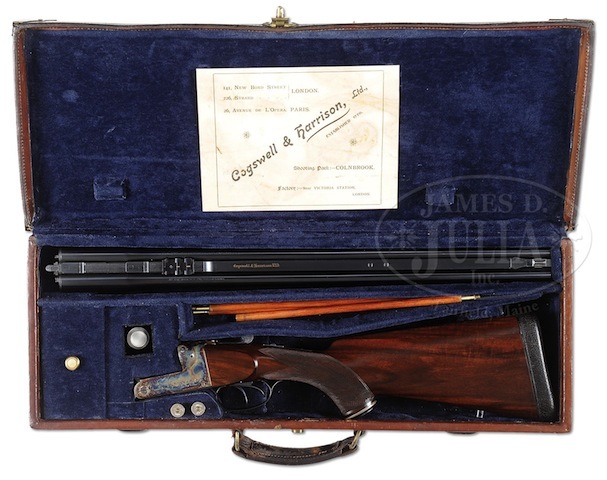 This fine double was bought at James Julia auctions and the photos here are from J.J. Eye candy, no doubt! A great find. In my .450 no2 Lang I shoot 105 grains of IMR 4831 and a 500-grain Hornady bullet for regulation accuracy. For solids I drop 3 grains. In 2003 I took a nice cape buff in Zim with my rifle and I'm sure Mark will send me a pic of his trophy with this great rifle! Thank's Mark. Note: The rifle perhaps had a scope on it at one time. The bases look original to me or certainly period to the rifle.